A family campsite close to a child-friendly beach, 15 km north of Halmstad in Halland, along the beautiful coast-road to Falkenberg. Just 1 h away from both Gothenburg and Malmö. We have a scenic family campsite with big, clean and fresh pitches. Dog exercise area and dog shower. 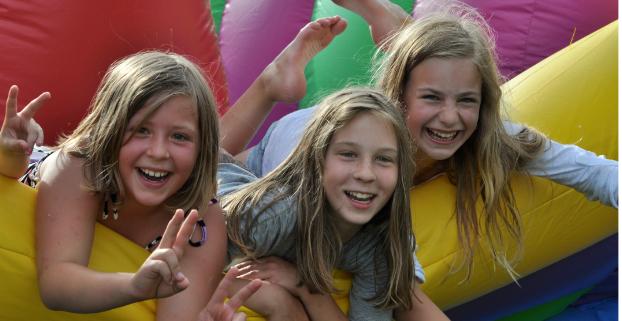 Activities, the children’s club Trollungar, bouncy castles, etc. weeks 26-32. 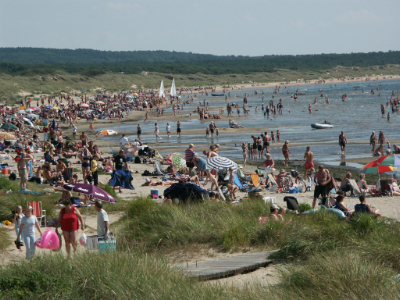 Trollbäckstigen Trail will take you on an exciting walk to our kilometre-long sandy beach Sälarevet, which offers great crab fishing. The salty water and sandy bottom make swimming a pleasure. Lots of space for games, yoga and relaxation. The beach forest and beach meadows offer wonderful nature experiences. - A round of golf on our adventure golf or on one of the nearby courses. 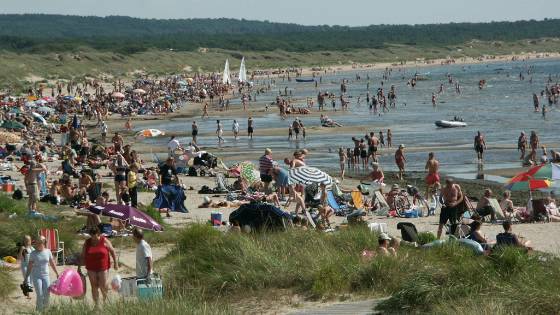 - Trips could include a day in Denmark with the Helsingborg-Helsingör ferry, a day at the Liseberg amusement park in Gothenburg, the Gekås cut-price store in Ullared, High Chaparral or Öströö fårfarm. 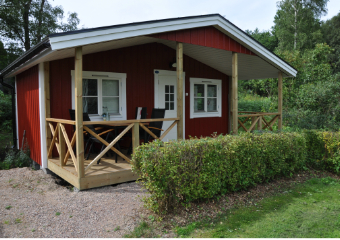 We wish you an enjoyable and relaxing holiday in Haverdal. Stefan, Anna-Lena, Rebecca, Eric and staff. 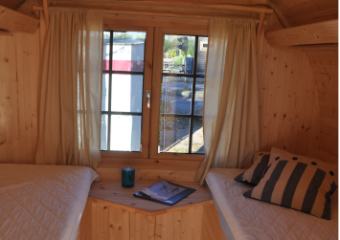 With us you stay in one of our cosy furnished caravans with awnings. 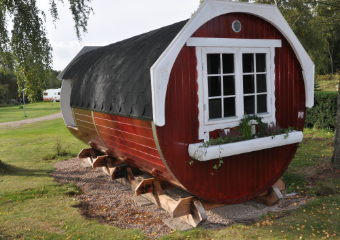 We also have nice cottages for rent. 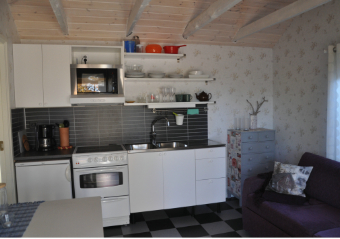 There are both fully equipped cottages with shower and toilet and more basic ones without bathroom. All cottages have patios. 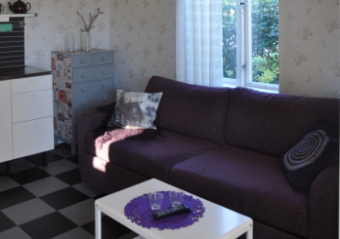 We also offer apartments to rent. 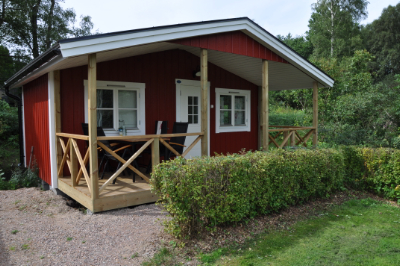 At Haverdal Camping you can try camping and live in one of the 2 cozy caravans with furnished awnings. There are also cottages for rent. 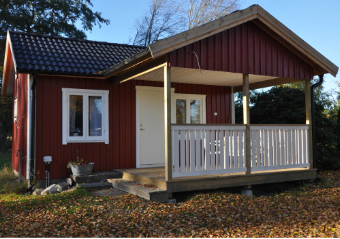 There are both fully equipped cottages with shower and toilet and more simple cottages without bathroom. All cottages have a patio. If you are a larger company, there is also an apartment for rent.